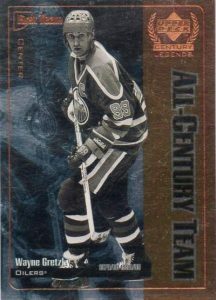 Flashback Friday – 1999-00 Upper Deck Century Legends	Overall rating:	0	out of 5 based on 0	reviews. Well, it’s Friday, which means it’s once again time to jump in ‘ol time machine and take a look back through collecting history. 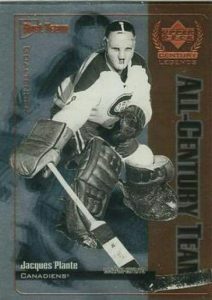 This week, we’re taking a look at what is probably one of my favorite products of all time, 1999/00 Upper Deck Century Legends. Released to celebrate the turn of the century this series featured the best of the best and gave collectors to some of the most legendary players ever. From the very outset this set proves to be well designed, and well laid out. The 90 card base set is broken down into 4 different categories. 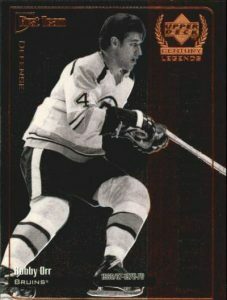 Cards #1-50 are set according to The Sporting News Top 50 Players, with Wayne Gretzky as card #1, and Gilbert Perreault as card #50. 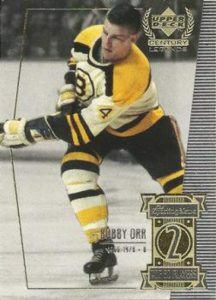 Cards 51-70 feature some of the best contemporary players of 1999, and include names such as Patrick Roy, Eric Lindros, and Mats Sundin. Some of these players such as Lemieux, and Jagr, also have cards in the top 50 ranking. Cards 71-80 featured “Century Phenoms” and acted as a display of the best young players of the time. Names such as Lecavalier, Drury, and Elias made this cut. 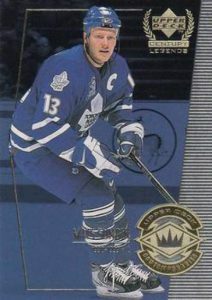 The final 10 cards (81-90) are completely devoted to Wayne Gretzky, who was named player of the Century. The base set also has a parallel set known as Century Collection, these are the same list done in gold foil and #/100. Personally I like this base set because of the sense of order that it provides, ranking the cards according to the player’s spot on the all-time list makes for a simple way to remember the order. With many modern sets having numbering systems that don’t seem to have any logical order (that I can see), it is nice to know that well laid out sets exist. Collectors can get most of the regular base without shelling out too much money, however the Century Collection parallel has been known to approach $100cdn for certain cards. The first insert set that Century Legends has (at least alphabetically first) is the All Century Team. This set is a combination of 12 players chosen by Upper Deck as the dream team of the century. While it does vary somewhat from Sporting News’ top 50 list, all the players make both lists. 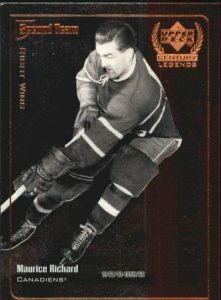 Names for this set include Jacques Plante, Wayne Gretzky, Bobby Orr, and Maurice Richard. This set makes me happy simply because the Jacques Plante card is the first I got from this product, while my collection only has a couple cards from this line, I still love and want these cards. As a hockey fan I would pay big money if it were possible for all these players to play at once. The 12 cards are divided into 2 teams and it would be an amazing game. This may well be my favorite autograph set of all time (and I don’t even own any yet). Featuring hard signed autographs of some of the best of all time, as well as some of 1999s best stars, this set poses a huge investment challenge for collectors. Perhaps the biggest name on this list would be Maurice Richard, as this was likely one of the last sets that he was alive to sign for. 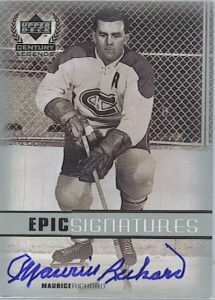 Any true fan would give their right arm for a hard signed Maurice Richard. 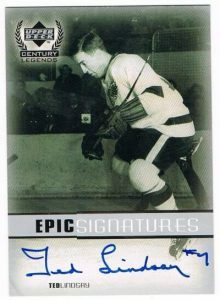 Other names that pop out include Jean Beliveau, Stan Mikita, and Ted Lindsay. With varying backgrounds throughout the set these cards are a beautiful addition to anyone’s PC. If the regular set isn’t enough challenge, there is also a gold version that is hand #/100. The big name players are hard to even find available in the regular version, so the /100 would be close to impossible to put together. The 8 card Essence of the Game insert set is a collection of dual player cards. 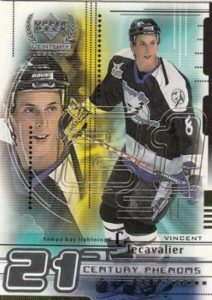 Each card features one legend and one active player (in 1999). This lead to combinations such as Gretzky/Kariya, Lindsay/Tkachuk, and Richard/Bure. For collectors this is probably one of the cheaper sets of the product to put together. The entire set could likely be found for around $30cdn, which is nothing compared to the autograph sets. This set is pure Greatness…literally. 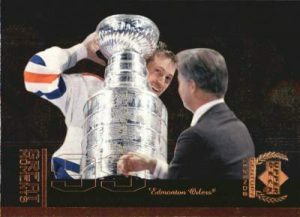 The 10 card set immortalizes the career of The Great One, Wayne Gretzky. 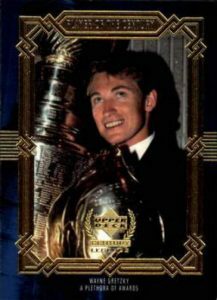 Featuring moments such as his 802nd goal and winning the Stanley Cup these cards are a nice set for Gretzky enthusiasts, and won’t run into huge costs, with most being available for a couple dollars each. The final set of Century Legends is the Jerseys of the Century series. 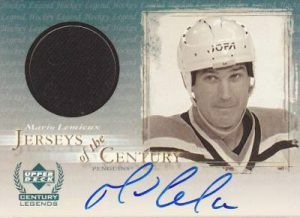 This set consists of nine cards containing jersey relics of some of the best in the game. Names such as Bobby Clarke and Mike Bossy sneak in here alongside Lemieux and Gretzky. For collectors who like a challenge the set also contains two autographed jersey cards, each numbered to 25. These two cards, featuring Bobby Clarke and Mario Lemieux are among the most expensive cards in the entire product with some asking prices of over $1000cdn on eBay, however with no recent sales it is hard to put an accurate value on them. I said at the beginning of this article that this is perhaps one of my favorite sets. 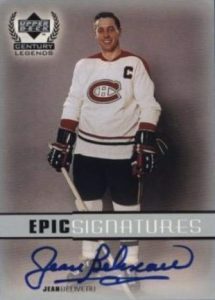 As a Habs fan I am always on the lookout for autographed cards of the great players. 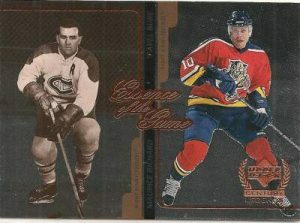 1999-00 Upper Deck Century legends fills that need with Beliveau, Richard, Dryden, and Robinson. 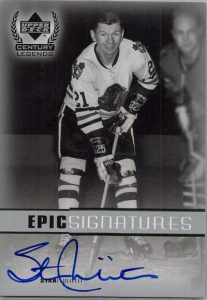 Add this to base and insert cards of even more legends and you have the makings of a great PC. I look forward to snatching up some of these sweet cards in the near future, and hope that my readers will enjoy this set as much as I do.